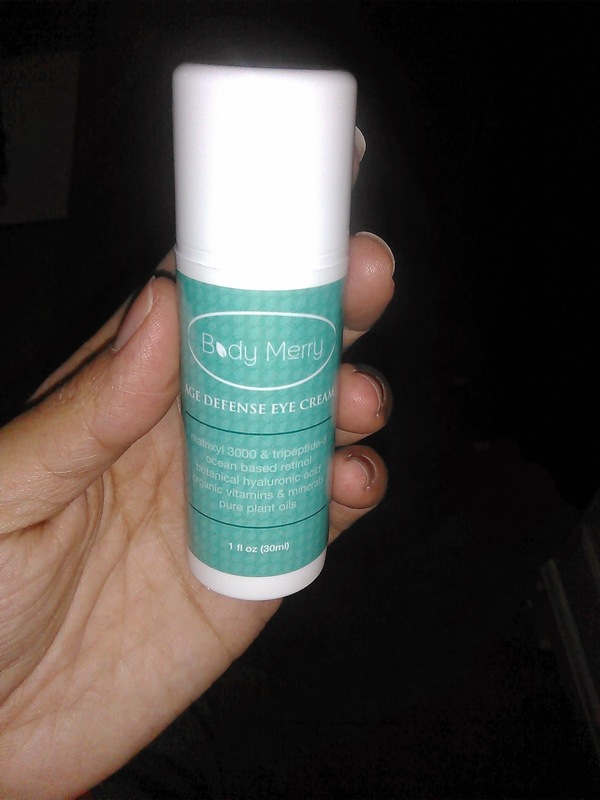 I was given the chance to try Body Merry Age Defense Eye Cream so here is my review. I tried this product under my eyes and the first thing that I noticed is that is feels very cooling under my tired eyes. I needed that! The cool sensation that I get after applying is always more than welcome when I wake up in the morning. It's a tiny pick me up. It's not too greasy nor is it sticky. You only need to use a VERY tiny bit or then it can get a little messy and you definitely don't want to get this product in your eyes. It might sting a little if this happens. It comes in a nice sized bottle, with a nice pump top for easy application. It contains some really good ingredients that I use regularly for a variety of skin concerns. Now, I like this product because of how it feels, but does it actually work? After using for a little while now, I still notice the bags, but they don't look as dark. Also, they're still a little puffy but not as much as before. Those are both two very good things. I don't really how deep wrinkles or crow's feet around my eyes so I honestly cannot say whether or not the product is effective for that. Overall, I just think that this product is probably great for those of you who have slight darkness or bags or just need to "wake up your eye area" a bit. It was not a miracle cream for me, but I doubt anything will be if I keep getting such little sleep. Need an eye opener? You can Buy Body Merry Age Defense Cream on Amazon or visit their website to learn more about their products.